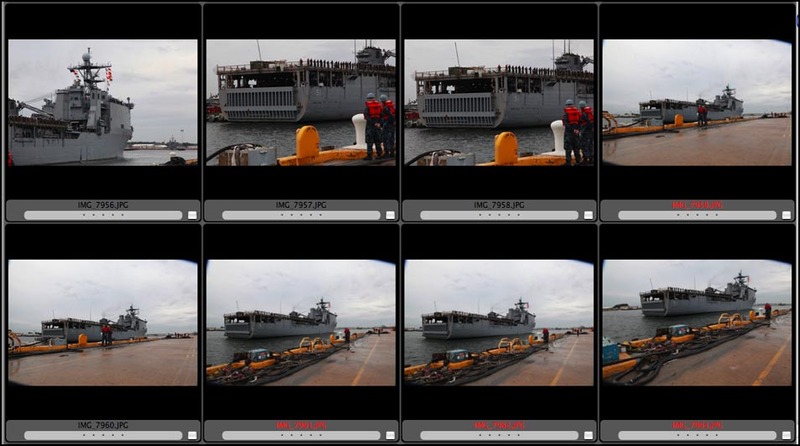 I was assigned to shoot video and stills for the homecoming of the Oak Hill on Little Creek Amphibious Base in Virginia Beach. 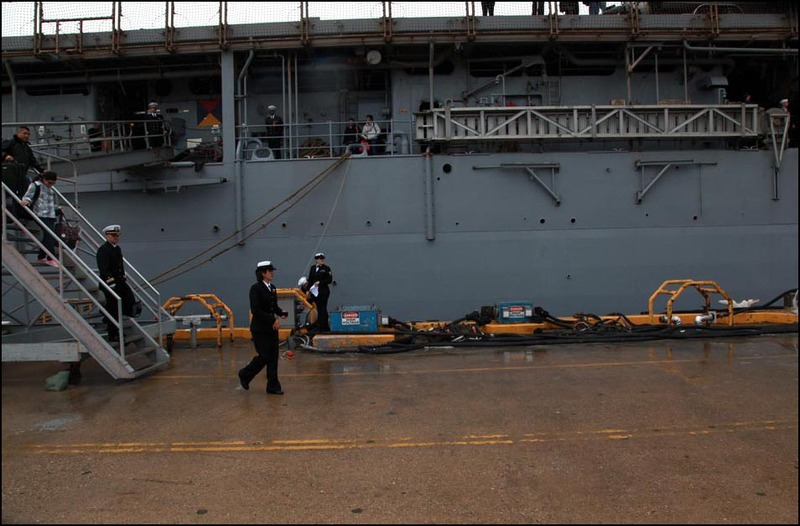 It wasn’t a particularly significant homecoming; the crew had only been away for 90 days. 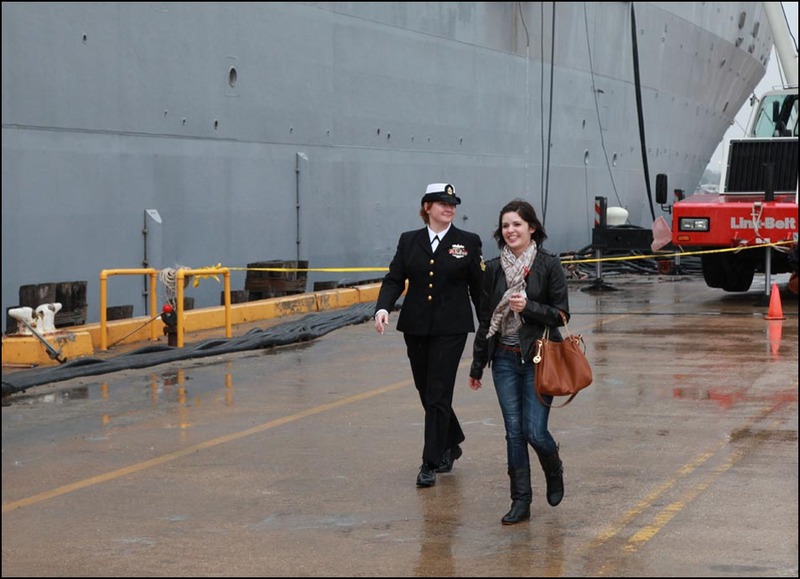 In fact, there was another homecoming in our area for sailors who had been through two different deployments in Iraq. What sparked our interest was that the news release said there would be a surprise that we wouldn't want to miss. 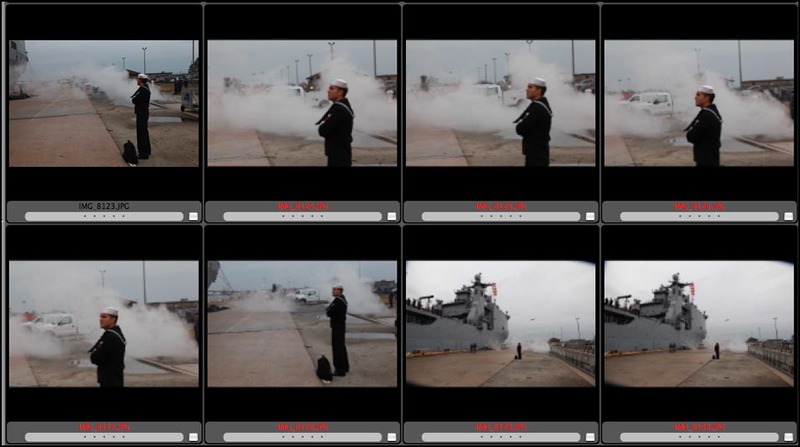 The director of photography, Randy Greenwell, asked if I would do both stills and video, which I've done before, but on this day I had a new video camera I'd never used before, not to mention I was a suffering from a mild case of the flu. 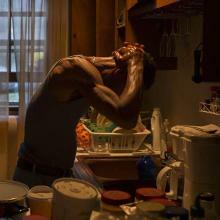 You're primarily a videographer for The Virginian-Pilot, but you also do stills. How do you know how to manage between the two, especially in these situations? In a situation where you're trying to shoot both stills and video, you have to predict when you're going to put down your video camera and when you're going to pick up your still camera and visa versa. Given that I probably couldn’t do both during a “surprise," Randy and I decided that I would concentrate on stills for this particular assignment. I knew I could get a lot of good video of the ship coming in, but I needed to get reaction from the family using the still camera. I had to be really prepared with the still camera for the surprise, whenever that would happen. Tell us about the scene when you arrived. At that point I thought, “Here I am, I'm sick, it's raining, I've got a new camera I'm not sure how to work, and I'm being told this will be national news story.” I knew it had something to do with the first kiss, but I had no idea what it would be. I saw a gentleman standing next to the ship. I thought likely he was there for the first kiss so I started taking pictures of him. A couple of minutes before the first kiss, the writer suggested that it may be two women. Soon after, I saw a woman standing with flowers and another woman walking towards her. I knew that was it. 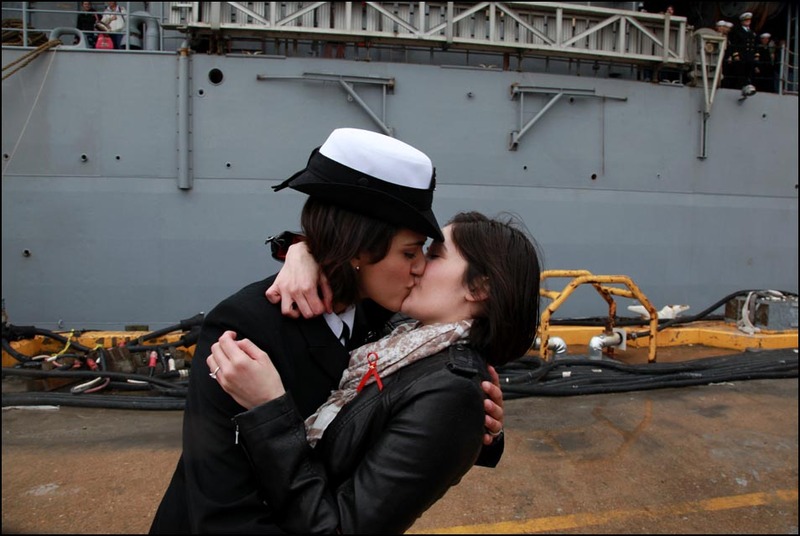 I also knew then that I would be witnessing the first kiss of a gay couple in the navy. What was in your mind at this point? My mantra has been always been: It's important to be open and adjust to circumstances as they change. Most of the best work I feel I’ve done, I wouldn't have predicted I was going to get on the way to the assignment. In my experience, good shoots happen through being patient, being alert and recognizing the situation as it comes to pass. You can shoot yourself in the foot by arriving and having an expectation of what you're going to see or what you're going to shoot before an assignment. In the end, you’re going to be frustrated trying to create that visual you thought you'd get, and you'll miss the visual you should be getting. Ok, now on to the moment. My first thought at that point was, I don't want to let the TV guys step in front of me. I've been to dozens of homecomings. I can't tell you how many times I've been shooting a first kiss and a videographer will come over and get within 4 inches of their faces and ruin my shot. My second thought was to make sure I had a clean shot with a clean background. My third thought was, I don't want to get the same shot over and over again, so I need to move my position. They were walking toward each other and I positioned myself where I thought they would meet and embrace. I got as close as I could, shot at two different angles, and fired away. It was a quick kiss, lasting a second or less, so I really only got a few frames of the kiss itself. Luckily, it was in focus. So, in many ways you previsualized the event by choosing a space and waited for them to come to the space. That's interesting. Can you talk more about this? I guess, for me, shooting has always been rather intuitive. It is taking the experience you have gained over the years and allowing yourself to work without over-thinking it. It's like a batter seeing a pitch, knowing it's a curve ball or a fastball. In other terms, you know what is in your mind's eye, and you try to position yourself to make the picture. What makes this particular story interesting is that I still had to concentrate on getting a video done. After the kiss, I chose to pick up my video camera and interview them immediately. After the interview was done, I sat my video camera down and photographed them walking away. It was a lot of juggling! Major media outlets used the image all over the world, and your video has been viewed worldwide. What are your thoughts about this? Of the countless stories I’ve covered in ten plus years, I've never encountered this type of reaction. I never imagined it would get the amount of attention it got; it was on just about every major news website, blog. The video has over a million views and climbing. I understand intellectually why this would garner national attention, that's not surprising, given the don't ask, don't tell policy repeal. This is a significant moment in time, and I understand why this photo is emblematic of the repeal. What's surprising to me is that the society we live in today makes this an issue. Personally, I think two women kissing is as natural and not much more surprising than a man kissing a woman. 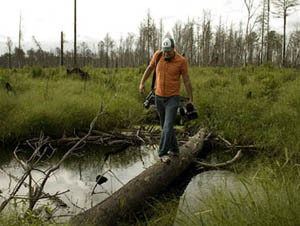 What advice would you give to other visual journalists about choosing to learn to shoot video as well as stills? It has been my experience working with photographers that most have a keen eye for detail and capturing "the moment". So I suppose my advice for photographers shooting video is to recognize that the moment is important but don't forget to get a variety of different looks at the subject or event you are covering. 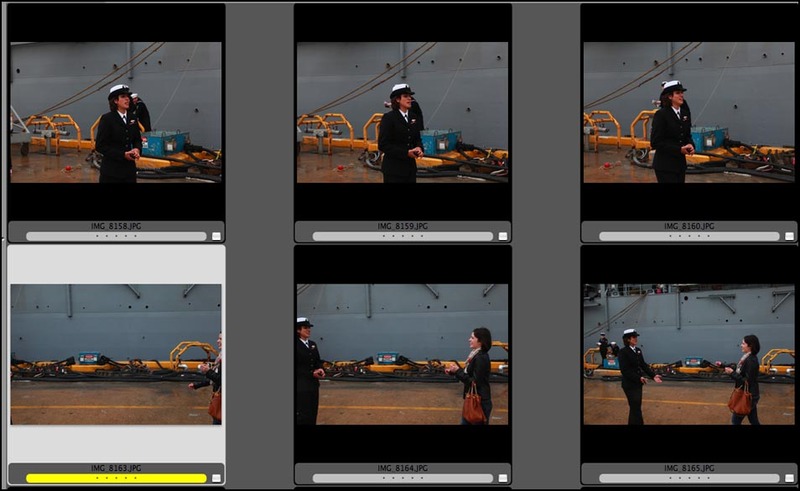 These shots may not be the perfect moment but are needed in the editing process. Video requires sequencing shots, cut-aways, tight, wide and medium shots. With enough variance, you have the tools you need to get into the editing bay and visually weave together a narrative. Lastly, don't forget to pay special attention to audio. As a video guy, I can tell you, audio is a very difficult medium to work with. There is always a lawn mower, wind or other annoying ambient noise that will make you cringe when you get back to edit. In conclusion, what have you learned about how you “see,” because you have to make choices all the time about when it’s appropriate to shoot stills or video? That is an interesting question! I can say that I've had the wonderful opportunity to work side by side with some pretty talented photojournalists here at The Pilot. I watch how they shoot and what they look for during assignments we are both assigned to. It is interesting to me because often times I'll watch my photographer colleagues go after a shot that I'm not interested in, and vice versa. What I've come to realize, and it may be fairly obvious, is that these are very different mediums. As a videographer, I'm constantly editing the story in my mind and asking myself: What shots go with the sound that I have? Do I have an establishing shot? Who would be the best to interview here? I can tell you it takes practice, and I'm still practicing, to flip that switch in your mind in order move back and forth from video to photography. I suppose what I'm getting at here, is that beyond technique, it is a learning process to train yourself psychologically to shoot both stills and video on the same assignment. Consequently, it is also my belief that either photos or video (maybe both?) will inevitably suffer in this endeavor. Brian J. Clark started his career as a Reporter/Photographer at several television affiliates in Oregon before landing at the Virginian-Pilot in 2006. Currently Brian is based in the photography department at The Pilot where he regularly shoots videos and collaborates on projects with other photographers and online producers. Brian Clark attended the University of Oregon graduating with Journalism and Italian majors. You can find more of Brian's work at www.brianclarkvideo.com.